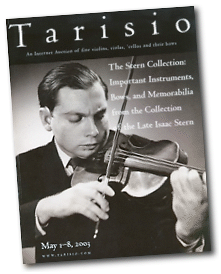 After the death of Isaac Stern in 2001, his estate decided to sell his entire collection of instruments, bows and musical ephemera through Tarisio. The sale, held in May 2003, attracted huge interest from bidders around the world eager to obtain items connected with the legendary New York violinist. Among the many world record prices seen in the sale was an astonishing $130,000 paid for a modern copy of one of Stern’s Guarneri violins by Brooklyn maker Samuel Zygmuntowicz. Also sold were nearly 30 bows including examples by Tourte ($43,125), Peccatte ($40,250) and Sartory ($37,375). Other items includes books from Stern’s private collection and correspondence, inscribed photographs, 19th-century presentation violin cases and even his humidor. Overall the sale grossed $2.3m, helping to make the sale at the time overall the second highest grossing violin auction of any auction house.